The foundation of Co-operative College Begusarai presently known as S.B.S.S. College Begusarai was laid on the birth day of Lord Buddha in 1970 . The college was established by the co-operation by People of Begusarai , teachers, students and college teachers of G. D. College Begusarai. Late Biswanath Singh Sharma, known as Malviya of Begusarai district, who embedded the ideas, philosophic vision . 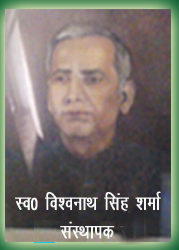 Biswanath Singh Sharma was not only –the great, educationist but also a leading personality of co-operative movement in Bihar this centre of learning and CO-OPELRATIVF, COLLEGE Begusarai came into being existence on 21 May 1970 and the reputation of being a important institution of the area . Since its inception it continue to maintain its glory and always uphold high radiations as recorded its aim and objects..
As, the institution was established on the birth day of Lord Buddha who is the symbol of Peace and Ahinsha of the world , So the institution has the responsibility to maintain the peace of the society. Education is not only a liberating force, it is emanating force for it strengthens social bond and property so ultimate goal to maintain peace in the society. This College is located in the industrial belt of north Bihar. It is being acknowledged that this has acquired the status of being industrial capital of Bihar. The existing public undertaking like IOC Barauni, BTPS Barauni etc have expended indeed the industrial, entrepreneur activity of the area. Diversification and Professionalism have become inevitable. The institution is aware of changing perception of the society and makes necessary modifications is methodology of its teaching to make it in time with the existing value system of life . The college is capital of meeting the challenges of modem system of education because of inherent viability of its own and the necessary infrastructures it has , The college has produced many civil servants, in numerable number of professors , doctors, engineers ands social workers .